Poole is the Jekyll butler. It’s a fully furnished Jekyll setup, designed to be a consistent and flexible starting point for Jekyll projects. It’s available today, and I’m releasing two open source themes with it. Out of the box, Poole is a Jekyll setup that focus on the content first and foremost. As part of the release of Poole, I’ve created two themes for folks. One, Hyde, has already been available for some time. The second, Lanyon, is brand new today. Each theme includes all the features of Poole, and then some. Hyde 1, my first open sourced Jekyll theme, was released in October. 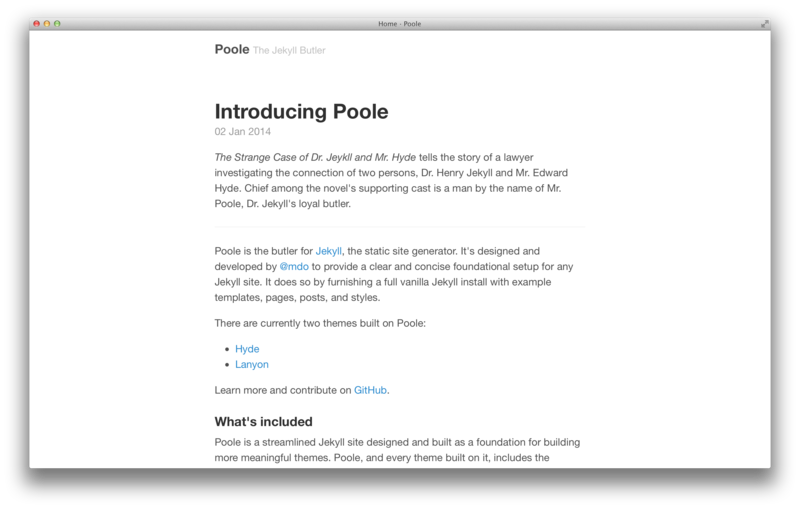 Along with the launch of Poole, I’ve redesigned and recoded much of it. 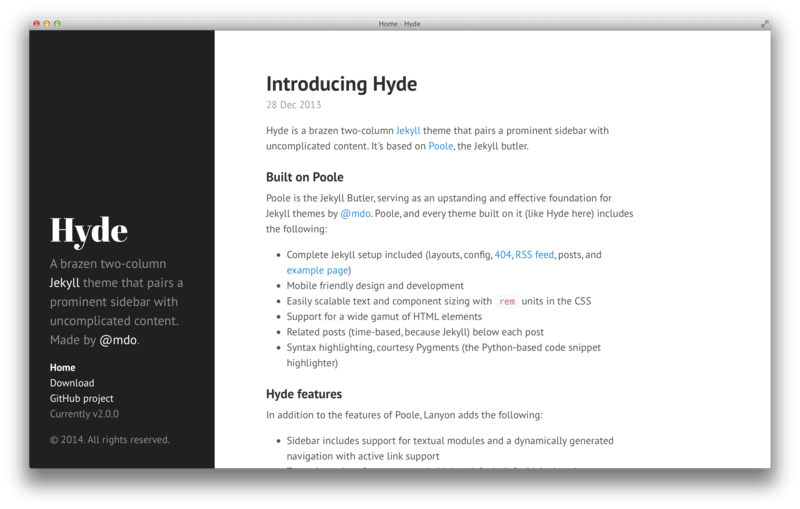 Today’s release represents Hyde 2.0. Overall it’s still the same theme, but with many improvements under the hood. If you’re wondering, Hyde 1.x is available on my GitHub account. However, it’s no longer being actively maintained. 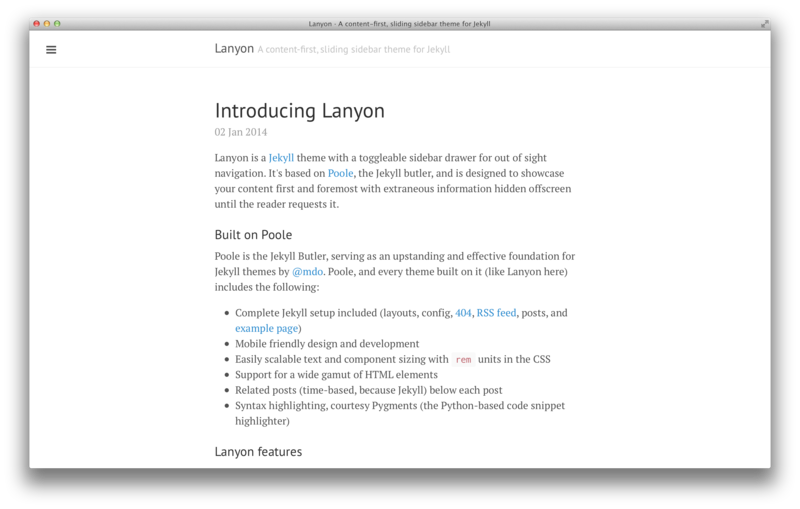 The second theme, Lanyon, is also being launched today. Hyde and Lanyon include auto-generated navigation lists with active link highlighting, eight optional color schemes (based on the colors of base16), and reverse layouts (sidebar on the right). 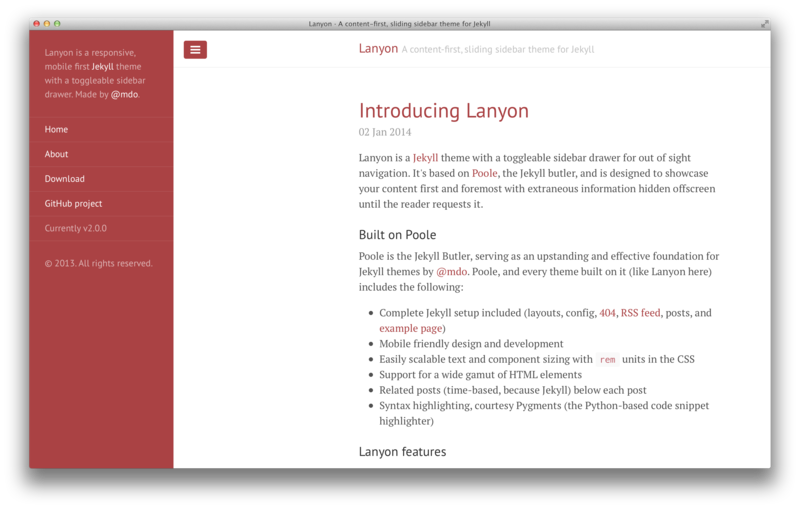 Docs for Poole, Hyde, and Lanyon are available in each project’s readme. The Poole docs include a basic walk-through for setting up Jekyll. Each theme’s readme focuses on only theme-specific features and none of the Jekyll setup process. If you’re not familiar with it, The Strange Case of Dr. Jeykll and Mr. Hyde tells the story of a lawyer investigating the connection of two persons, Dr. Henry Jekyll and Mr. Edward Hyde. Chief among the novel’s supporting cast is a man by the name of Mr. Poole, Dr. Jekyll’s loyal butler. It seemed fitting to name the project after such a man, given all he intends to do—for myself and the rest of you. Plus, it’s a killer naming scheme. To keep everything neatly organized, everything lives in a new GitHub organization, @poole. It includes Poole, the Poole homepage, and the two themes. It behooves me to mention that if you have a bug or feature request in any of the Poole-provided files (configs, layouts, poole.css, etc), please open issues in @poole/poole. Anything directly related to the theme (like in hyde.css or lanyon.css), should be addressed in the respective theme’s repository. 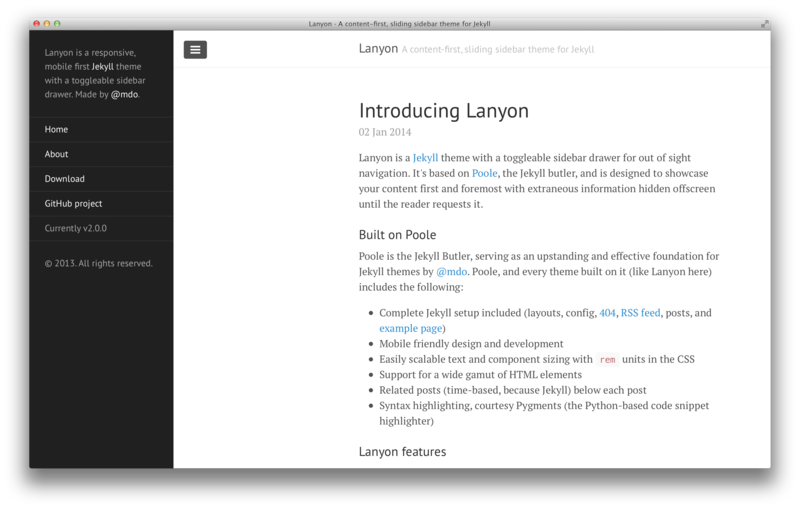 Snag Poole, Hyde, or Lanyon as you need from each project’s GitHub releases page. Watch the GitHub repositories to be notified of future downloads, or follow me on Twitter for updates when they become available. Probably some bug fixes and small feature requests, and soon maybe another simple theme. I plan on looking through my old blog designs for ideas on what to build next. If you have specific ideas, let me know on Twitter.